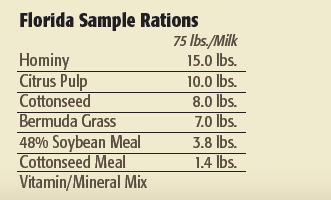 These sample dairy rations based on feedstuffs in various U.S. regions can be used a starting point for formulating a ration that includes whole cottonseed, and are examples of what a ration with whole cottonseed may look like. Western Washington producers generally pay more for feed while receiving lower milk prices. Yet they manage to keep their production levels higher than most other parts of the country. They also take advantage of Canadian feeds and ship in cottonseed from as far away as Arkansas. Whole cottonseed used in conjunction with homegrown feeds or purchased feeds helps Pacific Northwesterners keep their rolling herd averages well above the national average. Cottonseed, because of its high nutrient density, becomes a more economical feed to ship than some of the other dairy staples. Whole cottonseed is well positioned in the California market and is priced favorably to other feedstuffs. 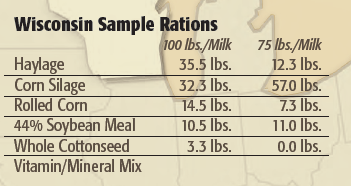 Of all the feeds offered in these comparative rations, whole cottonseed is one of only two feeds that remain at maximum usage across all three production strings. In the heart of dairyland, where most producers grow a large share of their feed, imported feeds still play a critical role. Whole cottonseed, because of its unique nutrient profile, is cost competitive and nutritionally effective for high-producing cows. At lower-production levels, cottonseed has a more difficult time competing with on-farm feeds. Cottonseed proves both cost-effective and nutritionally effective for high-production strings in New York. Balancing for 100 pounds of daily milk at maximum dry matter intake levels, gives all energy sources an even chance. Still, cottonseed is the best choice for high-energy rations in New York. Supporting high levels of production can be accomplished using either cottonseed or another high-energy source. Dairying in Florida, a forage deficit state, can be a real challenge. High feed costs, especially for premium-quality alfalfa, and hot humid summers, cut into profits. Despite those hardships, Floridians have two advantages: lower whole cottonseed prices and higher milk prices. Even for lower-producing strings in the heat of summer when feed intakes are low, cottonseed in Florida is a good low-cost ingredient because it provides an array of nutrients, such as fiber, energy, and protein. Cottonseed meal is also priced right in the South; however, special attention should be paid to gossypol levels when cottonseed is fed in conjunction with cottonseed meal or cottonseed hulls.